29 May 2012: Ground temperatures stayed low during the very cold spring of 2012, but have risen dramatically in the final little heat wave of May 2012. The temperature is up to 13.5ºC, as warm as it ever gets in summer, usually, and may get warmer with the addition of Tubes and the cleaning of water out of the Manifold. Running costs for the house reflect the weather too. They sank to what may be an all time low in January 2012, but with the cold spring, and the Sunbox being out of action, it was inevitable that they would rise. 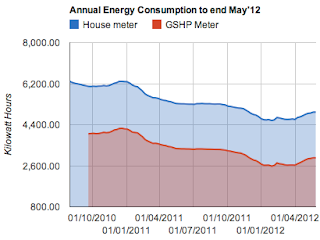 However, the house annual running cost is below 5,000 kWh and the GSHP annual is below 3,000 kWh, which is what matters greatly to me! The summer has arrived, and no heating is required till October. 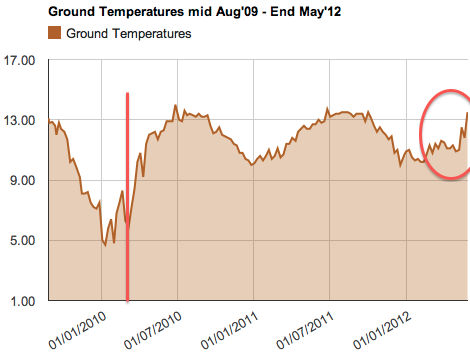 The upturn was caused by cold spring, but the figures have levelled off.